Hot tubs maintained by The GENESIS Device are virtually maintenance free, and greatly reduce cost and aggravation by eliminating the purchasing, transporting, storing and handling of bromine tablets and other chemicals. The popularity of the GENESIS Device is growing rapidly and is quickly becoming the choice of many of the industries prime spa manufacturers. This bromine generator system electronically creates bromine via an electrolytic process thus eliminating the need for conventional bromine tablets and the support ancillary chemicals they necessitate. 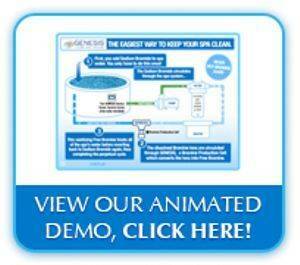 Imagine spa water that never requires bromine tablets, scheduled shocking, and is virtually self-maintaining. The GENESIS Device has changed everything!